Hi everybody! I hope you are all having a blessed day. The sun is shining here on the sunny Central Coast of NSW Australia and after the mini heat wave yesterday, it’s a perfect Spring day today. 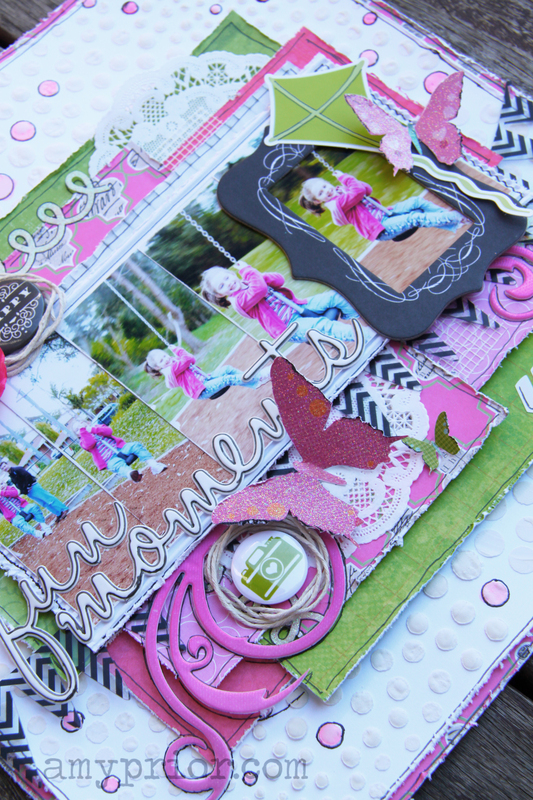 Today I am back to share a quick layout with you all created for the new the Color Room challenge that has just been posted today. Remember you now have 2 WEEKS to get your TCR entries in which is super exciting! 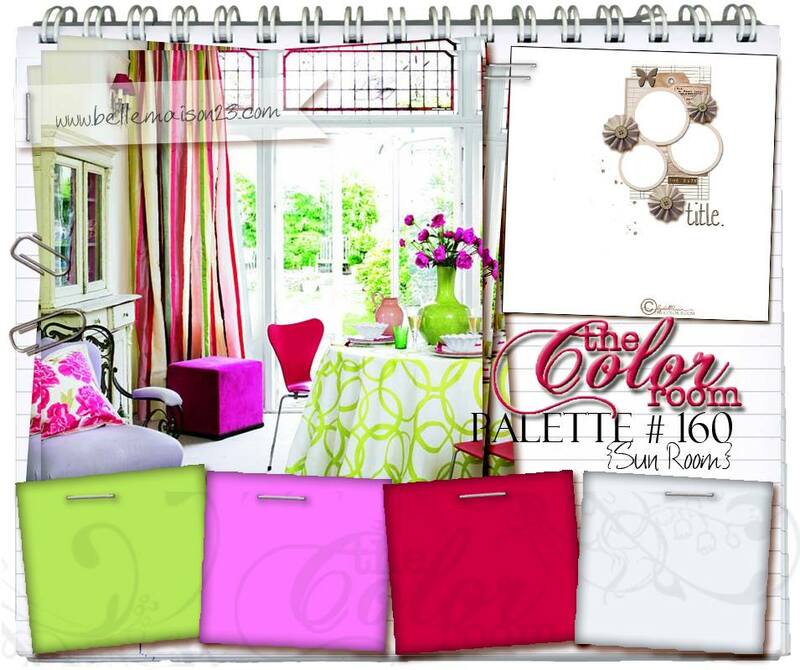 Checkout the Color Room website here or the Facebook page here to checkout this fortnight’s palette and enter for your chance to win some fabulous prizes from our sponsors! I have lots of closeup shots for you of course. Checkout the background detail. I have used a Crafter’s Workshop 6×6 mask in each corner and then doodled and watercoloured some of the circles. Doesn’t it look fun? The papers are all random from my stash and include brands like My Minds Eye, BoBunny, Websters Pages, Pink Paislee, Fancy Pants & Authentique. I have also fussy cut the butterflies from an old piece of Kaisercraft Specialty Patterned Paper. How fun is the glitter on the butterflies! The kite sticker is from an old Echo Park collection and the Chalk frame is from the new My Minds Eye Chalk Studio Collection. I just love the contrast of the black on the frame as well as on the Heidi Swapp Acetate Banner. I have cut up a Flourish with a Bling Jasmine Puff Flourish and added it randomly plus I have added some flair from Lil Somethin & Fancy Pants. The watercolour on the background circles was actually created using Faber Castell Bubblegum Pink Gelato. 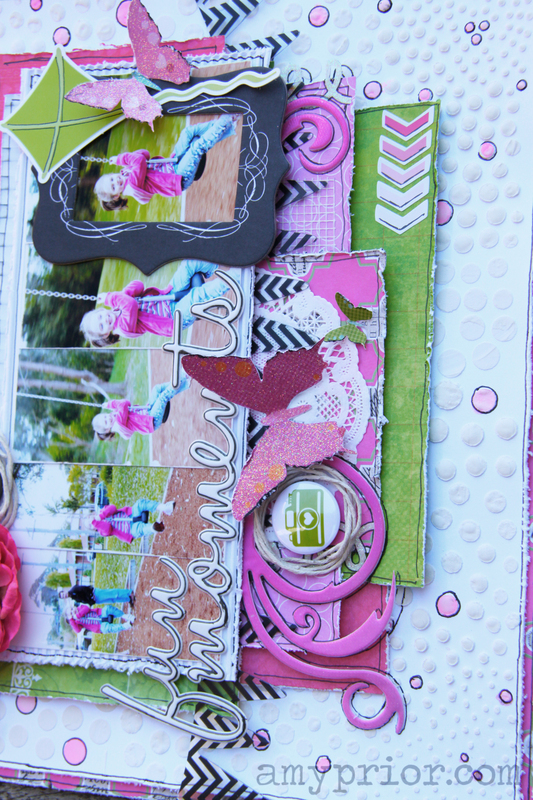 The fabulous title is from the Pink Paislee Artisan Elements Words which are so fun to play with! Well that is it from me for today, be sure to check back tomorrow for more inspiration! Hi everyone! 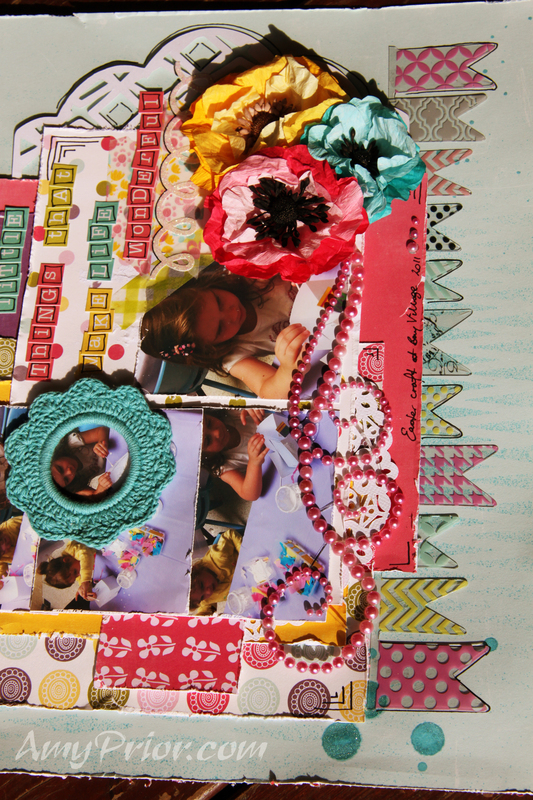 I am back quickly today to share with you all this month’s fabulous challenge over on the Flourish with a Bling Blog. You can see the blog post here by Chloe who has chosen a fabulous quote challenge for you all this month. Here is my example layout. 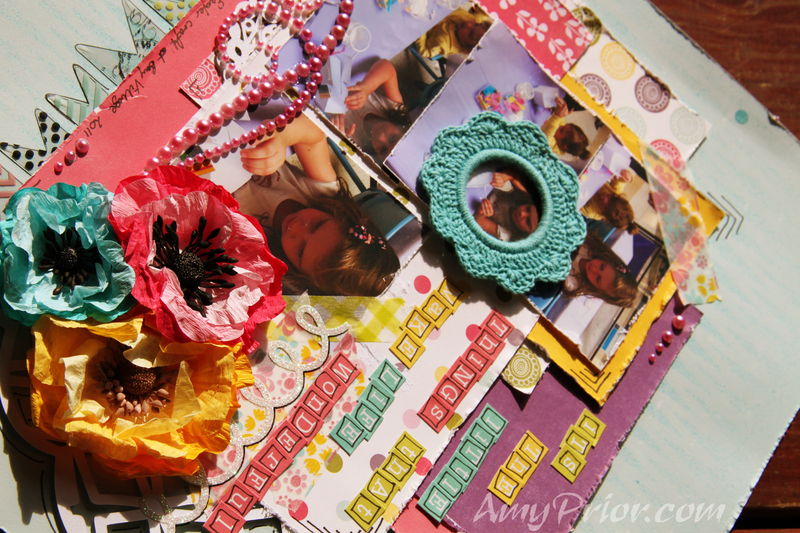 The papers that I have used are an old collection from Echo Park Paper called Springtime as well as some fabulous Prima Marketing Flowers. I have misted my background using a Crafters Workshop Stencil and some Heidi Swapp Color Shine in Teal. I then dripped some of the color shine as well. Add some Heidi Swapp Banners, Flourish with a Bling Chloe Flourish, Typo Crochet Frame, Stickers and doodling and I was done. 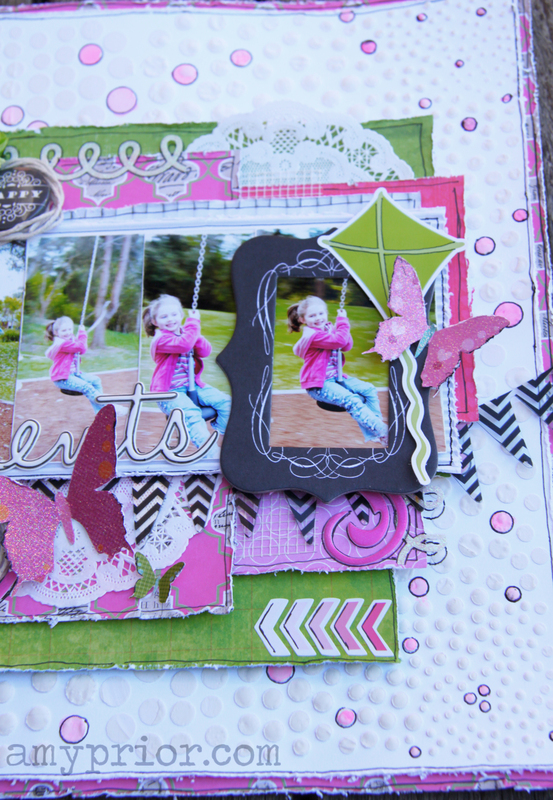 I just love the colours in this layout and I am loving Chloe’s quote challenge. That’s it from me today, be sure to check back tomorrow to find out the winners of my June/July Blog Giveaway!! Check back Wednesday for the announcement of my A2Z Blog Hop Giveaway! !